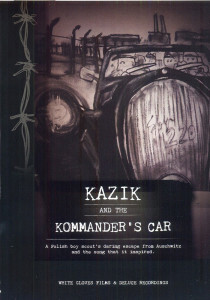 Dedicated to the honour of Polish boy scout Kazimierz ‘Kazik’ Piechowski, this DVD commemorates the 70th year anniversary of his escape from Auschwitz in 1942. Songwriter Katy Carr visits Gdansk, Poland to meet Kazimierz ‘Kazik’ Piechowski (b1919) and play him her tribute song “Kommander’s Car”. Through Kazik’s powerful response to the song he shares his memories of the last do-or-die moments of the escape where the impossible became possible.